Home DIY Projects	Paint Color for Guest Suite! TGIF, friends! After four trips to the paint store, I have finally decided on a paint color for our guest suite! And it’s only getting painted once, so it better look good. If not, tough cookies. Choosing paint colors is HARD. The guest room also had a ceiling fan, but no overhead lights. 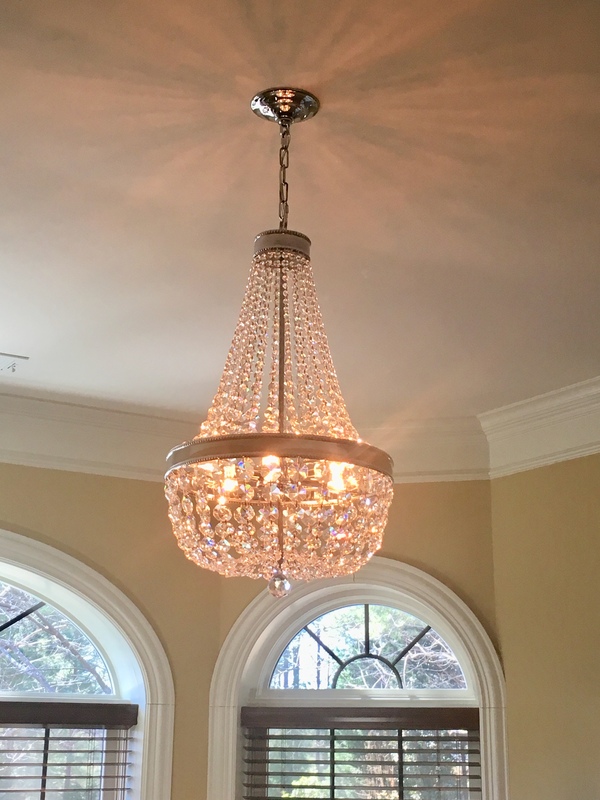 This problem was easily remedied by the addition of a lovely new 6-light chandelier! (Thank you, Bob!) Already this room is growing on me. And, it would appear the trim in this room is white, right? Wrong. Therefore, choosing a paint color that goes well with the trim is tricky, especially when I don’t know the actual color of the trim! I tried 5 different colors of paint. I’m a little proud of myself for only buying the little pint size samples from Sherwin-Williams for $6 each instead of buying a whole gallon. That could have been a costly mistake. Also, SW will mix up a sample in any finish you like, in my case, I chose Satin. I tried Accessible Beige first. I still love the color but it has gray undertones and therefore doesn’t look right against the taupe colored trim or the dark wood in the adjoining kitchenette and bathroom. Then I tried a few other samples until I finally landed on Tapestry Beige. (975) The color is very close to the color of the trim and that’s okay. I want this room to be calm and soothing and let the accessories do the talking. This is actually a Benjamin Moore color, but I had it mixed at my local Sherwin Williams store. TIP: SW is having a great sale right now with all paint 30% off and paint accessories 35% off. According to Apartment Therapy, Tapestry Beige is a “non-nasty neutral: Beiges that won’t drain your soul.” Good to know. Benjamin Moore calls it, “inherently sophisticated and endlessly versatile,” and is part of their “off-white” collection. Based on this, I’m guessing I picked a good beige. I’ll let you know. So, now that I’ve made a total mess of the guest room and basement, it’s time to roll up my sleeves and start painting! Tapestry Beige, please do me a solid, and be the perfect color and go on in one coat. (Insert praying hands emoji) Hopefully by Monday, this will be a distant memory and I’ll share the results of my efforts. Here goes nothing! Bye-bye yellow!